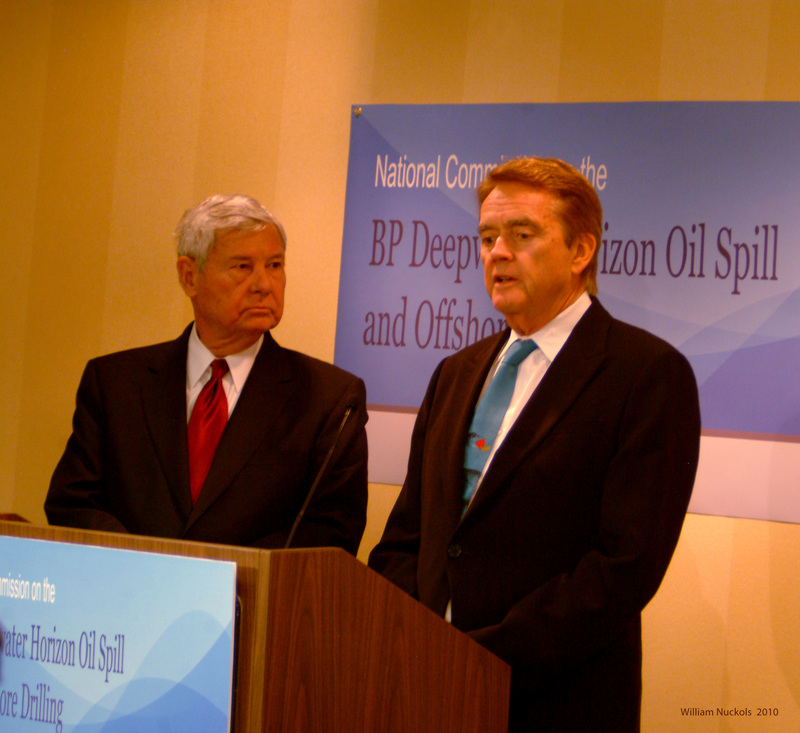 Bob Graham and Bill Reilly respond to questions during a press conference during the second day of the President's Oil Spill Commission in New Orleans, LA. Photo by Will Nuckols 2010. Today at the lunchtime press conference during the first meeting of the President’s Oil Spill Commission, Chairs Bill Reilly and Senator Bob Graham fielded questions from a range of local and national media. Questioned yesterday on the first day of the meeting about the intention of the Commission and whether they will focus on moratorium for deepwater drilling, the Commission chairs stated that they believed the issue of the moratorium would be handled best by the Administration, and that the Commission would be primarily forward-looking. Reilly stated that large part of the contribution of the Commission will stem from its findings on the future of oil drilling in the U.S. – not just in the Gulf of Mexico, but also in other sensitive areas. Reilly highlighted Alaska as one of those areas of concern. But today the Commission may have changed its approach just one day into its work. Noting the significant concern expressed by so many people on the moratorium – both concerns expressed by witnesses at the hearings, as well as by people the commissioners met during their trips to gulf communities over the weekend – Reilly stated that he has changed his mind about how much emphasis should be paid to the moratorium. While these statements may be seen as Administration criticisms, I suspect this is exactly the independence that the President wanted when he set up the Commission. If they are to act as a commission of independent experts, examination of Administration decisions must be a part of the analysis if the Commission’s final recommendations are to be of the highest value to the President.